A cruise along the Stratford upon Avon canal, the Rivers Avon and Severn, visiting historical towns like Worcester, Tewkesbury and Evesham, and the home of the Bard himself - Stratford upon Avon. Allowing two weeks enables a detour down to Gloucester to visit its docks, warehouses and museums. Cruise from the medieval village of Alvechurch with its pretty half-timbered houses through idyllic stretches of countryside to Stratford on Avon. On the River Avon in Spring and Autumn water levels can fluctuate dramatically, so cruising might not be possible , please find out from the marina before setting off. You will need a licence to cruise on the River Avon, which you can obtain as you join the Avon at Tewkesbury or Stratford upon Avon. The marina will give you current licence costs at the start of your holiday. Allowing two weeks enables a detour down to Gloucester to visit its docks, warehouses and museums. Worcester ,Tewkesbury, Evesham and Stratford each offer a superb mixture of culture, history and shopping. Cruise from the medieval village of Alvechurch with its pretty half-timbered houses through idyllic stretches of countryside to Stratford on Avon or to Warwick. Continuing on through the Tunnel, for those with children you might want to make a short detour to Cadbury World (booking is advisable) which is 1 mile north of the Kings Norton Junction. Before you turn off at the Kings Norton Junction, onto the Stratford on Avon canal, there is a an old Canal House on your left, and as you turn you will see the interesting guillotine mechanism of the now disused Stop Lock which was balanced by chains and counterweights. The Canal briefly passes through a small tunnel and the quiet residential outskirts of Birmingham before leaving it behind and passing out into open country. There are very few villages along this stretch, but there is a steel lift bridge which is lowered and raised electrically, and you will need your British waterways key for this. One button does all! 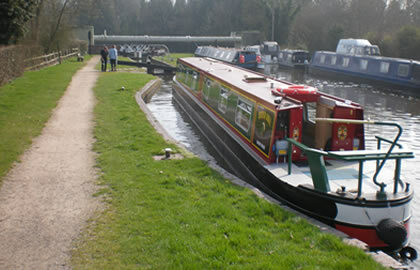 The Canal continues through the countryside until you get to Hockley Heath where you can get refreshment at the nearby Wharf Inn, because soon you will encounter your first locks, the first 4 of the 20 or so Lapworth Locks, but you can do the rest tomorrow! If you moor up for the 2nd night after Bridge 31 you can walk down to the Boot Inn by locks 13/14 at the bottom of this lovely flight of Locks. It is 7 hours and 20 minutes cruising from Hopwood to here. You can then have a good breakfast next morning ready for the next locks. The locks are surrounded by very pretty countryside so it is worth having a brief look around. Ignore the left hand turn after Lock 19, and continue on to locks 21/22/23/24. The Canal continues south pursuing a fairly direct and wholly peaceful course only interrupted by some locks now and again. The Fleur-de-lys pub at Lowsonford is a lovely 15th century pub, where the famous Fleur-de-Lys pies were once cooked. At Wootton Wawen there is a craft centre, coffee shop and farm shop just 2 minutes away from the canal to the west. The village has plenty of timbered houses, and the oldest church in Warwickshire, dating back over 900 years. You can moor up in Wootten Wawen basin for your 3rd Night's stay, here the Navigation Inn overlooks the canal. It is 8 hours cruising from Lapworth Lock 6 to here. In the morning you will soon you will cross the small cast iron aqueduct which carries the canal over the A34. After Bearley lock you will cross over the 200 yards long Bearley aqueduct, another cast iron construction carrying the canal over a shallow valley. The next village you come to at Wilmcote . This small and attractive village is where you can find Mary Ardens House, now owned by the Shakespeare Birthplace Trust, and open to the public. There is a nice pub here- The Masons Arms, where you can get some refreshment before the start of the flight of 11 Wilmcote locks just south of here. After dropping steeply through 4 more locks in Stratford upon Avon, you enter the splendid great basin in the middle of the riverside parkland beside the Shakespeare Memorial Theatre. You have plenty of time to moor up and have a wander around Stratford upon Avon. After exploring Stratford upon Avon, cruise onto the River Avon, passing the Royal Shakespeare Theatre on your right, you soon leave behind all the tourists and travel through the peaceful countryside only interrupted by the occasional lock. On the River Avon you can only moor up at designated Visitor moorings, there is no right to moor and land as you please, unlike the canals where there are long stretches of towpath to moor up against. Be prepared to moor up side by side where necessary. Max speed is 6mph downstream. There is a splendid old bridge at Bidford-on-Avon, and some good pubs if you can find mooring space. The River continues through the Vale of Evesham downstream through pleasant meadowland & orchards on its way to Evesham. Evesham Country Park at Twyford is a short walk on your right hand side as you approach Offenham on your left. This is a shopping & garden centre & also incorporates the Vale Wildlife Centre. There is a narrow gauge steam railway running through the 130 acre Park. On the approach to Evesham keep to the right and avoid the weir just before Evesham lock. After the lock there are 3 lots of Visitor moorings along the River, as the Avon cuts a loop around Evesham, the first and most extensive are by Workman Gardens. There are many pubs and restaurants in Evesham, and even a night club! On Leaving Evesham, if you need a pump out for for toilet tank, there is a free self-operated pump out on the west bank, immediately upstream of the railway bridge. Take care near here as there is a cable across the river, this will be lowered when the ferry man hears 3 blasts of your horn. The River continues through unspoilt landscape, when leaving Chadbury Lock take great care to avoid the Weir. Passing Evesham Golf course you approach the village of Fladbury, be careful as there is a Canoeing Centre here, and Ferry wires across the River which are invisible from upstream. Fladbury is a picturesque village of half timbered houses and cottages around a square. Soon you will reach the small market town of Pershore , with its Georgian buildings . All services & swimming baths are by the River, there are moorings above Pershore Lock. There are various pubs and restaurants in the town. It is 4 ½ hours cruising to here, so ideal for a lunch break. The stretch to Tewkesbury takes another 4 hours & continues past lovely countryside, past small villages. There are moorings if you continue on past the turning to the River Severn. Cruising time to here from Evesham is 8 hours 20 minutes. Tewkesbury is best known for it's Abbey , and is where the Avon meets the Severn. Time to explore the historic town of Tewkesbury with its many attractive and ancient buildings including of course, it's cathedral-like Abbey, which is reckoned to be one of the finest Norman churches in the Country. The abbey was completed about 1120, and is splendid both inside and out. Its magnificent and beautifully decorated tower stands at 130 feet high and 46 feet square, and is the largest Norman tower in existence. The most unusual buildings in Tewkesbury are the row of medieval shops near the Abbey, in fact most of the medieval aspects and character of the town have survived to this day. There is a resident lock-keeper at the Avon Lock. If doing this ring in reverse, you can buy a licence for the River Avon from the lock-keeper here. Cruise onto the River Severn but be careful and look out for a shallow spit of land projecting out on your right. You should not turn North (right) until Mythe Bridge can be seen in its entirety. (Mythe bridge was built by Thomas Telford). Soon you will pass another delightful town on the River Severn – Upton upon Severn- with its fascinating old timbered & early Georgian buildings. The best area for pubs & hotels is near the River. The River continues on its way up to Worcester with its wooded banks and in some parts tall, steep, red cliffs, with occasional glimpses of the distant Malvern Hills. On the approach to Worcester you negotiate the paired Diglis Locks, after this there are the 2 locks that lead into the Diglis basin and the Worcestershire & Birmingham canal which is where you are headed. After another couple of locks you can moor up in Lowesmoor Wharf. It is 6 hours Cruising time to here from Tewkesbury. Worcester has plenty to offer the visitor, including the imposing cathedral which dates from 1074. In Friar Street is Greyfriars, dating from 1480 this is one of the finest half-timbered houses in the country. Charles II escaped from here after the Battle of Worcester in 1651. It is now owned by the National Trust. There are many bars, pubs and restaurants and takeaways around Worcester, and plenty of shops to stock up on supplies, or for a little retail therapy. Leaving Lowesmoor Wharf, continue up the Canal passing through a few interspersed locks as you tun away from Worcester. There are not many villages on this stretch, but there are moorings by Bridge 30 at Dunhampstead, and Canal side at bridge 35 at Hanbury Wharf. The Eagle & Sun pub is canal side at bridge 35. Cruising time to here is 6 ½ hours. Hanbury Hall is soon passed and it reached by a footpath leading southeast from lock 17 (Astwood Bottom Lock). This National Trust property is a red brick house built in 1701 in the style of William & Mary and little has been altered. Soon you have reached the flight of 5 Astwood locks, there are 5 locks a bit further on at Stoke, where there is a well placed pub just after Bridge 48 , a good place to moor up before the 30 flight Tardebigge locks are reached tomorrow. Cruising time to here is 4 ½ hours. I should have a good breakfast because after negotiating the 5 Stoke locks you are now ready for the ascent of the fantastic Tardebigge locks, which is a flight of 30 locks set in very pretty rural surroundings, which can take 4-5 hours, but there are places in between the locks where you can moor up & have a breather! Tardebigge Reservoir can be seen off to the right. After the locks is the 580 yards Tardebigge Tunnel shortly followed by the 613 yards Shortwood Tunnel. Alvechurch marina and the end of the journey is soon reached after this. I am sure you agree that this cruise is one of the best Canal & River cruises that there is, taking you through some beautiful countryside and some historic towns. If taking 14 days, stay for a-while in Stratford upon Avon, Tewksebury and Worcester.